This quote of Dawna Markova reminds me that creativity requires giving up our usual and comfortable way of doing things. Erich Fromm similarly stated “Creativity requires the courage to let go of certainties.” Charles Dickens, in the same vein, said “The important thing is this: to be ready at any moment to sacrifice what you are for what you could become”. I am a person who, after developing a certain level of competence or “success”, enjoys practicing continually, developing habits that allow me to become “lost” in the creative process. This does produce a gradual sophistication of my output. However I lose sight of the fact that quantum leaps in creativity, and the enjoyment thereof, are the product of learning and melding new capabilities. It is because the transition period often produces “unsuccessful” results that I naturally resist change. These quotes remind me of the shortsighted nature and long term constriction of this, more comfortable approach. The remainder of this post refers to the photo at the top of this post. 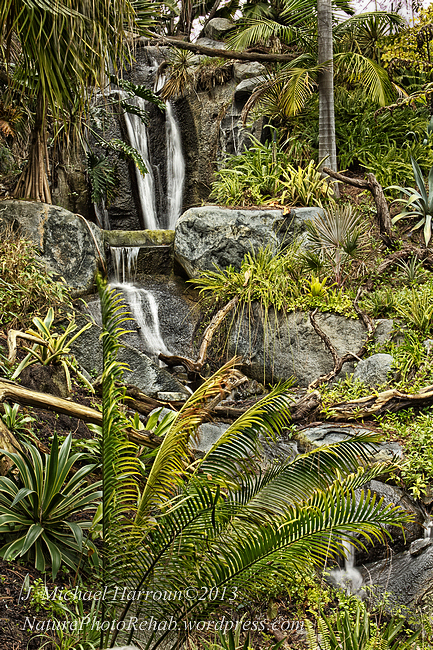 It is a highly processed image of a water fall in San Diego Botanical Gardens (previously Quail Botanical Gardens) located in Encinitas California about 15 miles north of the city of San Diego. I highly recommend it to anyone interested in nature or photography. It is roughly 50 feet (four stories) high. This is the original, unprocessed image. Many people will like it better than my processed version. I respect that. Processing:My intents were first to exaggerate detail and secondly to make the water more apparent by increasing its brightness. First, minor processing was done in Adobe’s Camera Raw (added a little “clarity” and “vibrance”, reduced noise and slightly sharpened (pre-sharpening which is not destructive as is output sharpening). Then Nik Color Efex Pro 4 was used to considerably increase contrast and detail (“detail enhancer” filter). Photoshop Elements was then used to dodge (increase the brightness of) the water and burn (darken) some of the bright rocks and the sky in order to direct the eye more toward the water. Finally Nik Sharperner Pro 3 provided output sharpening for display (This is the destructive type of sharpening that should be done as the very past step of the processing). Now, at the top of this post, it appears as I wish it would have looked to my eye at the time. I will reprocess this image several more times in different ways/styles for comparison (and maybe be a little creativity). I am available to assist photographers who are just beginning their experience with photo processing. This entry was posted in Digital imaging, Digital Photography, Nature Photography and tagged digital imaging, digital photography, nature photography, photo processing, photo retouching. Nice shot ! You do need to use your camera enough that it becomes second nature to you. Many opportunities in nature photography are fleeting; you don’t want to miss it because you couldn’t remember how to over-ride the auto-exposure setting, etc. So don’t limit your photography to nature; use your camera where ever and when ever you can. When composing a photo, look for something that sets the image apart. 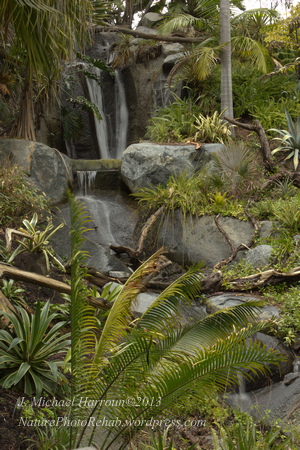 It can be as simple as a nodding bud, a curled fern frond or a single leaf. With sadness in my heart, I wish to note the passing of John Michael Harroun (7-3-48 to 7-25-13). He was my friend, my mentor, and my heart. I hope you have found the peace now that you found in your photos. Goodbye, Mike. I can’t decide which I like better actually. Both are great. I can see why some would have a preference, but maybe I’m just not picky enough. Thank you for your kind compliments. I’m glad that you like them both. I really like the vibrance and clarity in your processed image, but for my preference is feels a little too processed. I do love the way you’ve highlighted the water – a very successful choice, I think. Thank you for your compliments and for taking critiquing my photo. I’m glad you liked the quotes. I had forgotten about them for a while. I completely agree with your assessment of the image. It reflects heavy processing. I am beginning to process each image three ways: 1) how it actually looked to me, 2) how I wish it had looked and 3)surreal. This photo is how I wished it had looked, but probably most people will not relate to it as I do. Perhaps I will put both versions (but not the surreal) into future posts. The only time I have a “problem” with heavy editing is when people try to pass it off as how it actually looked. Since photography is so personal, you’re never going to satisfy everyone. Some are going to much prefer the heavily edited shots, and some staunchly think that straight out of the camera is the way to go. I just like to see what you’ve done and get an idea of how you did it! Thank you for taking the time to comment. I agree with you regarding heavily edited images. They are a legitimate option as long as they are defined up front as impressionistic or surreal. I did not make that clear in relation to the image at the top of my last post. In a few days, I will edit that posts text and include The realistic version of that photo for comparison. Thanks again for your constructive criticism.